Lately I've been feeling the whole smoked out hair vibe, where pretty colours look smouldering hot. It's almost as though the smoked out hair is an evolution of my beloved pastel hair, so that's what I ended up going for. The colours look like darkened pastels, as if they've lost their squeaky clean look and been given a dark edge to them. The overall look is silky, smooth hair in incredibly pretty colours with an air of mystery thrown in to the mix. I'm not going to go in to my bleaching process, as it hasn't changed a jot since I posted THIS - if you want to know how I bleach, check that link (or THIS ONE) then come back here! So, to achieve my mysterious smoked-out hair look, the first thing I had to do was let the existing colour in my hair fade back down to silver. My hair was a mixture of plain old Directions in pink, violet and blue, so getting it to fade wasn't too much trouble. Within just a week, it had faded down to a silver colour, with the odd section here or there with a little bit of blue or pink peeking through. As long as it's not vivid, it's no big deal. 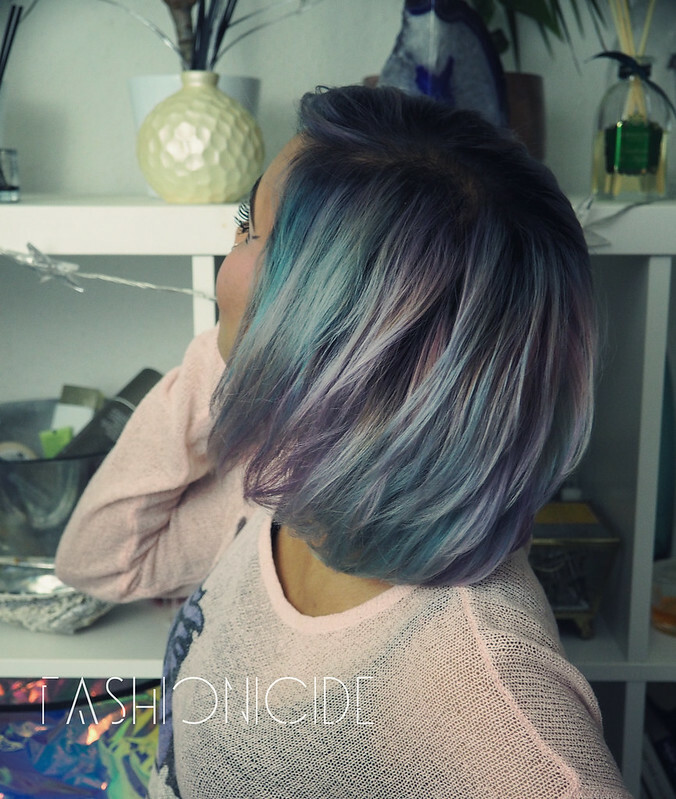 The next question is of course, what dyes will I use to achieve my Smokey Pastel look? Luckily enough, I'd ordered a haul of Pravana dyes a week before, and they'd arrived just in time. But why change from Directions to Pravana? The truth is, you don't really have to, however I'm looking for longevity now and that's something that Directions struggles with. I was seriously impressed by Pravana's longevity though, when I died my hair grey using Pravana's Locked In Silver (post HERE). So Pravana would be my weapon of choice this time around too. 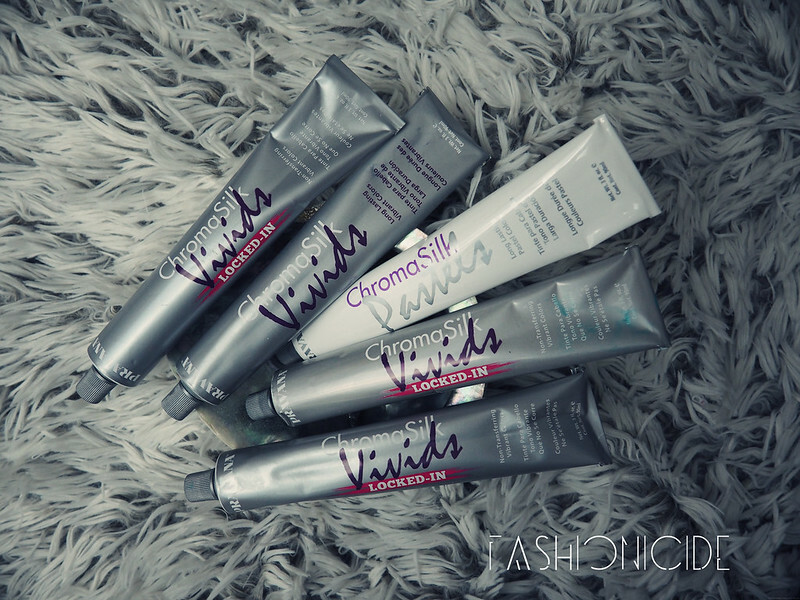 Pravana Chromasilk Vivids - Locked In Teal, Locked In Purple, Locked In Pink & Locked In Silver. To get your hair ready for the dyeing, I washed it in the shower without using conditioner. Using conditioner would form a barrier over the hair and prevent the dye from having any significant effect, so none of that around dye-time! Next, I towel dry my hair and run a comb through it to get rid of those pesky knots. 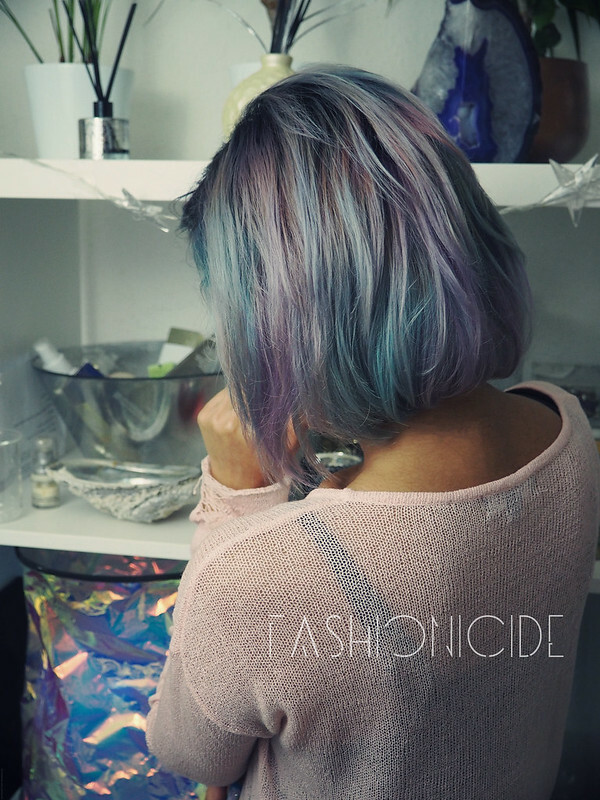 Grab yourself a couple of bowls, enough for one bowl per colour, squeeze in some of the Pravana dyes and add conditioner to bring down the vibrant colours to something more pastel-y. For this look, I only mixed in two colours together - Locked In Teal and Blissful Blue - in order to make the Teal less green and more minty. I know some find diluting hair colour with conditioner a bit confusing but it's actually quite straightforward. Add a small amount of dye to the bowl and squirt in some conditioner (make sure it's white though!) and start mixing it up. The colour you see in the bowl should translate on to the hair, providing you've bleached it very light. So, if the colour appears too dark, add some conditioner, if it appears too light, add some more dye. Simple! I section my hair using clips and begin applying the colours to random sections, and alternate each section with another colour. The aim is to apply the dyes in sections, and to attempt to mix up the colours so that very few sections of the same colour are right next to each other. Once my hair is completely covered in dye, I stick on a shower cap (I know, attractive! ), then wrap my hair in a turban (being Indian helps for this part!) and leave it on overnight. Pravana state you can leave the colour to process for 20-30 minutes at room temperature, however I tend to leave it on overnight in order to intensify the colour, almost as if the colour is being cooked in to the hair. There's no need to worry about damage to the hair, as the Pravana colours are actually a conditioning dye, basically a hair stain. There's no peroxide or bleach contained within, so you're safe! When I wake up in the morning, I remove the turban and shower cap then rinse off the dyes. This is where I feel that Pravana dyes have a massive edge over pretty much every dye I've ever used - the water runs clear. That may not sound all that impressive, but if the water runs the colour of the dye, and you're using more than one colour, they end up running into each other. So because Pravana runs clear, you can rinse away to your heart's content knowing that the blue won't run in to the pink. The colour you applied, will only appear on the sections of the hair you applied it to! And that really is that. It's ever so simple once you've got the dreaded bleaching out of the way. After rinsing and blow-drying my hair in the morning, I was literally speechless at how my hair turned out! Whenever applying colour to the hair, I always have this mental image of exactly how I want it to look, and rarely does it ever turn out that way in reality. But this time around, with Pravana's Locked in dyes, I have beautiful swirls of pink, smokey purples, grey and mint. It looks absolutely sensational, even if I do say so myself! As Pravana is not a UK-based brand, they're not all that readily available on our shores. However, Haircrazy do sell them on their website, so all is not lost. Also, Jen from Glasgow Fashion Girl has told me that you can actually get them much cheaper on eBay - so get looking! I'd love to hear what you guys all think, and what hair colours or trends are currently tempting you in to taking the plunge and making that giant leap in to the world of coloured hair? You look INCREDIBLE! This sort of effect would only happen to me by accident - I'm so impressed that it turned out how you wanted it to! Out of interest, how long will the colour last and how do you go about refreshing it? Will you need to let it completely fade again before re-dyeing? I think when it comes to refreshing the colour, I will most probably need to let the brighter colours fade out as much as possible before topping up as when it comes to sectioning the hair first time around, it won't be exactly the same next time. Wow your hair looks amazing!! 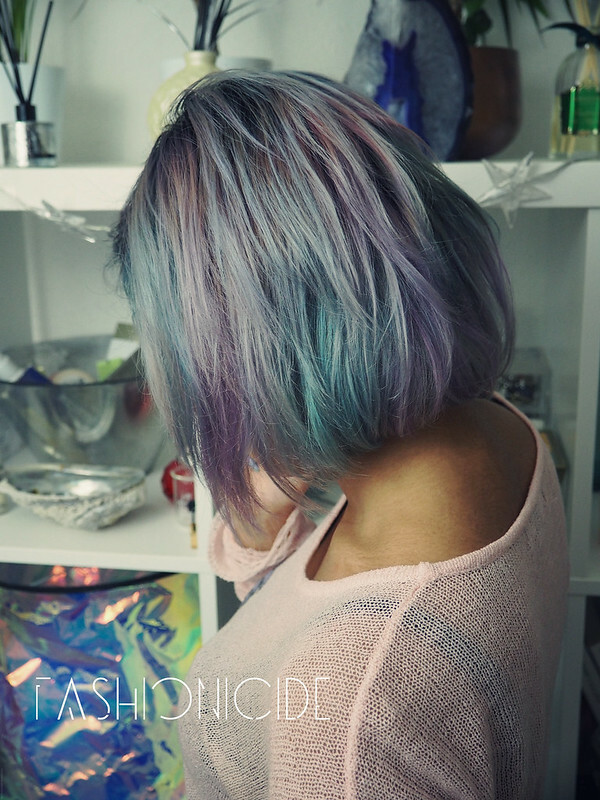 I have never died my hair (apart from highlights) but I really wish I had the courage to go for something like this. That is so good that this dye turned out how you want it! I imagine that is the worry when you do it that it will go wrong and you won't like it. Gorgeous! I'd love to dye my hair like that, but I doubt my boss would be very happy about that. Lina! Your hair is looking incredible at the moment! Love this hair colour, it looks so pretty.